I’ve known my husband over 40 years. If you ask anyone who knows him, they’ll tell you he’s a real sharing kind of guy. Will give you the shirt off his back. He shares his love of Star Trek, his computer knowledge, and his sense of humor with me. 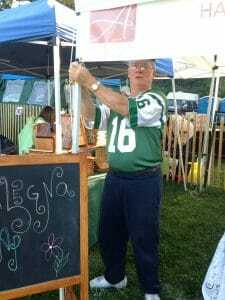 He shares his time and helps me set up at the different events I do. Sometimes he even stays and sells soap. Unfortunately, this week, he shared his cold with me. I’m starting to feel better. Being sick has made me grateful for more than a few things. Being able to sleep without waking to blow my nose. Being able to breathe through my nose. Being able to cough without my head pounding. Being able to talk without coughing. Being able to swallow without my ears hurting. 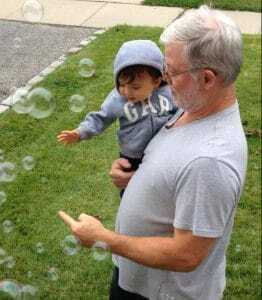 However, what I’m most grateful for this week is that I was well enough to hold Luke when he came to visit Poppy and Gigi and Alegna Soap® new bubble machine! I’m grateful for my friends and family, my garden, and my fireplace! I hope you feel better soon! It seems like everyone is sick (myself included). We love the bubble machine around here. My niece, nephew, and dog all go crazy with it. Enjoy! Thanks Kristen! 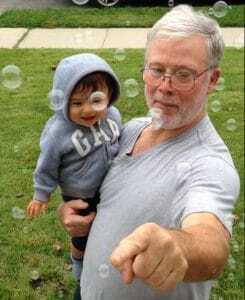 We Love that bubble machine too! Glad you’re feeling better. 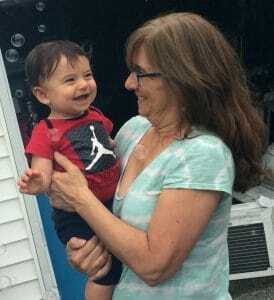 I love the look of pure joy on your grandson’s face. I know Donna, I love that look too! He is just SO happy. his smile is infectious.